Councilmember McDuffie convening a public roundtable to examine the District and WMATA's responses to the January 12th incident at L’Enfant Plaza Metro Station. On Tuesday, February 3, Councilmember McDuffie introduced the “Adequate Notice of Affordability Expiration Amendment Act of 2015”. The bill will provide low and moderate income tenants with more transparency on changes made to their rental agreements. Currently, a significant number of affordable housing recipients do not receive adequate notice when their rent increases. In tax-credit buildings, where private developers receive incentives to incorporate affordable housing units in a development, rents are only required to remain affordable for the duration of the tax credit. There is no requirement that building owners provide notice to residents of the expiration of their affordability contract, which may result in potentially drastic rent increases. The bill will require owners of affordable housing rental buildings to provide at least 90 days of notice to tenants when their rent is subject to an increase as a result of all obligatory affordability requirements being met. On Thursday, February 5, the Committee on the Judiciary – of which Councilmember McDuffie is the chair – and the Committee on Finance & Revenue held a joint public oversight roundtable to examine the responses of the Washington Metropolitan Area Transit Authority (WMATA) and the District’s public safety agencies to the January 12, 2015, incident at L’Enfant Plaza Metro Station. Witnesses at the roundtable included WMATA, the Fire and Emergency Medical Services Department (FEMS), the Office of Unified Communications (OUC), the Metropolitan Police Department (MPD), and the Homeland Security and Emergency Management Agency (HSEMA). "Doing something 'like a girl' should never be considered an insult," stated Councilmember McDuffie. 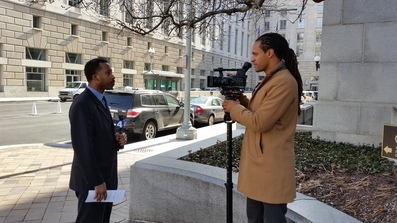 In an interview with NBC 4's Zachary Kiesch, the Councilmember discusses a popular Procter & Gamble Super Bowl advertisement and his legislation, the "Title IX Athletic Equity Act of 2015". The bill will increase the quality and quantity of athletic opportunities for girls in District of Columbia traditional and public charter schools. To watch the entire television segment, please visit http://www.nbcwashington.com/video/#!/news/local/D-C--Council-Member-Wants-More-Student-Athletes-to-Play-Like-a-Girl/290998251. 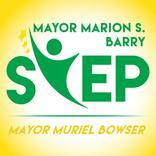 The Mayor Marion S. Barry Summer Youth Employment program has started accepting applications. If you know any young people ages 14-21 who might be looking for work this summer, this is a great opportunity. You can apply online: http://does.dc.gov/service/summer-youth-employment-program. If you have any questions about the program, please call (202) 698-3492 or email Summerjobs@dc.gov. The DC Tuition Assistance Grant (DC TAG) is now open. Students are encouraged to apply early. No applications or supporting documents will be accepted after June 30 or until funds are exhausted, whichever comes first. To apply please visit http://osse.dc.gov/service/dc-tuition-assistance-grant-dc-tag or call (877) 485-6751. The February 15th deadline for enrolling in a Qualified Health Plan through DC Health Link is around the corner. One week before the enrollment deadline of February 15th, DC Health Link is targeting last minute shoppers urging them not to wait until the last minute to enroll in quality affordable health insurance. 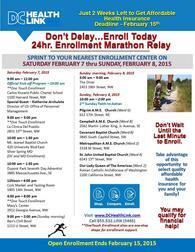 The "24-hour Enrollment Marathon Relay" will provide opportunities around-the-clock for consumers at various locations to enroll before the final rush weekend. For a complete list of enrollment centers, please visit https://dchealthlink.com or call (855) 532-5465. 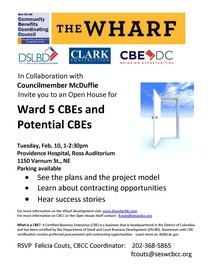 Councilmember McDuffie is co-hosting an Open House on the Wharf Development for Certified Business Enterprises on Tuesday, February 10, from 1 to 2:30 PM. Please stop by if you are interested in hearing more about current and future contracting opportunities.